We recently hired someone for the team, and there were two commonalities to those who applied: everyone was a great writer, and pretty much no-one excelled at video production / post-production. This is a problem, because writing is a dying communications requirement. A few years ago, I would ghost write multi-page CEO updates. Now, we video the CEO in 1-2 takes, throw a little b-roll at it and add some titling, write 50-word intros on to yammer, and our work here is done. The video looks beautiful, mind. We have some good kit, camera, mics etc. The team set it up and knock it down again; then get to work in post-production, cutting and zooming to create some visual dynamic. Easy – if you know what you are doing. Yet too few communicators know one end of a camera from the other. No, they want to write! Yet the post on our social network was just a chatty sentence or two. 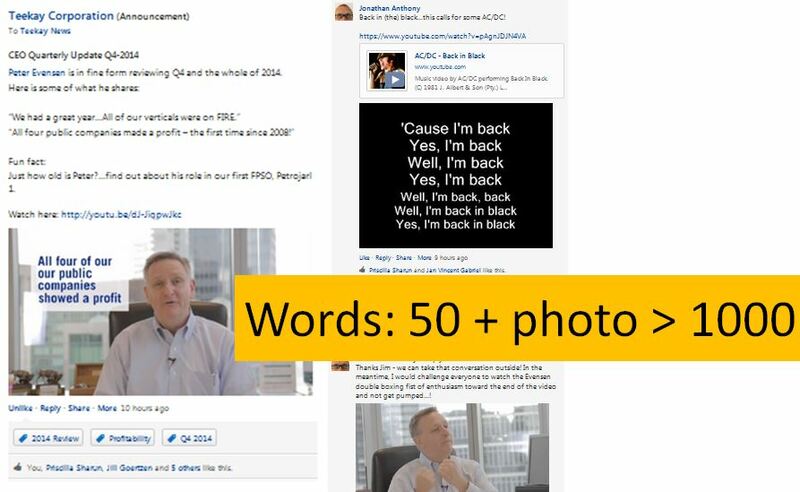 Part way through the video, the CEO reminded everyone that we are back in the black (a profitable 2014!) That reminded me of AC/DC, so I linked a youtube video to the post, to add a little stim, to resurface the post to the top of the feed. A couple of funny comments followed, then I challenged colleagues to wait for the CEO showing his boxing skills near the end. Just a little more stim to the conversation. Now, maybe I was being creative and clever. Maybe. But the writing were skills an eight-year old can muster. And really, we can usually get away with the video editing skills of a typical 8-year old too! We have a couple of bright young things (adults, to be sure!) who can pump out videos all day long – we made well over 100 videos in-house in 2014. Video editing is a modern-age MarComms requirement.